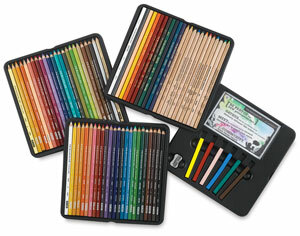 There are several colored pencil accessories that are very helpful and many artists swear by. A pencil sharpener is the most important tool involved with colored pencils since they must be kept needle sharp all the time. There are four kinds of sharpeners: small hand-held sharpeners , sharpeners with a crank mounted to a wall or desk, portable battery operated sharpeners and large electric sharpeners with a cord. I find using a manual sharpener is time consuming and impractical for this slow medium. If you spend a lot of time manually sharpening your pencils, you'll find your wrist will be sore due to the repetitive motion. You can use a battery operated electric sharpener for its convenience and portability, but watch out for battery burn out within a relatively short time. Because of this, an electric sharpener with a cord is a must. It should be capable of sharpening a colored pencil to a needle- like point. 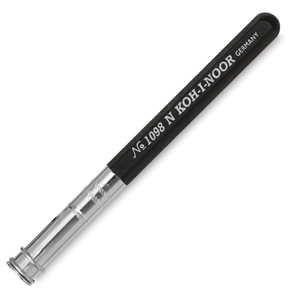 Purchase an electric sharpener with a shallow 'throat' that enables the pencil to be sharpened down to a small stub. It will save you money in the long run. 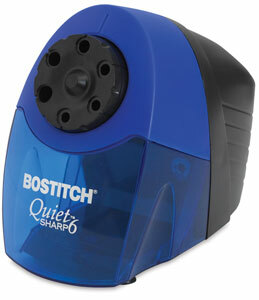 It is even better if your sharpener has an auto stop feature that stops when the pencil is sharpened. Remember to place a trash basket in your workspace to hold the shavings, which will save even more time. Although colored pencils are not known to be easily erased away, erasers do help in removing residue built up from the painting surface, as well as contributing to creating an artwork itself. However, you still need to plan well before you start a painting to minimize erasing large areas. But having them as colored pencil accessories in hand is a big plus once you make mistakes. Erasers that are suitable for colored pencils are the following: kneaded erasers, white vinyl erasers and imbibed erasers. Kneaded rubber erasers - these putty-like, pliable and nonabrasive erasers should be your first choice of erasers for colored pencil artwork. They leave no debris and can be shaped for erasing small areas and lifting pencil crumbs. They do not damage your surface. You can erase heavily built up layers of colored pencils, but keep in mind the process can be time consuming and messy. White vinyl erasers - they are best for erasing large areas of colored pencils. They are also non-abrasive, much like kneaded erasers. However, the disadvantage is that they shed debris, so you'll need to clear the surface diligently. Imbibed Erasers - they are impregnated with erasing fluid and do a great job of erasing built-up layers of colored pencils, doing the least damage to the paper. Some erasers such as Pink Pearl, ink erasers and art gum erasers are used for graphite pencils and charcoal. They are not suitable for colored pencils. 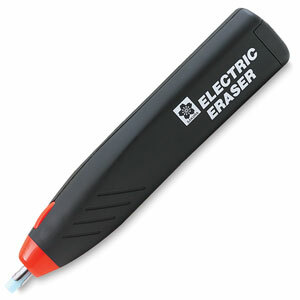 Electric Erasers - they are efficient tools to save you a lot of time. Electric erasers come in battery, rechargeable and corded models. White eraser strips come with larger corded and rechargeable erasers, but white vinyl and abrasive ink erasers are only available for small battery-powered types. Use small erasers for precise erasing, and corded or rechargeable erasers for large areas on the paper. Generally speaking, large electric erasers with an imbibed eraser strip perform best, a small battery-powered eraser with a white vinyl strip the second, and a kneaded eraser the least. Keep in mind that erasing will always leave a ghost-like layer behind in colored pencil paintings. You might prefer erasing when the layer is not too heavy yet. You won't need to use solvents for your colored pencil artworks, but chances are you'll like what they do for you. As one option of all the colored pencil accessories, solvents dissolve the binder and allow the pigments to spread around, darkening the pigment at the same time. Use clear solvents so there is no issue of color tainting. You can use odorless turpenoid (the solvent I use), rubbing alcohol, gin, or even vodka. Each solvent varies in terms of their working characteristics. Experiment with each of them to see how they dissolve the pencil binder, how it spreads, how it is absorbed and reacts with the paper surface, how fast it dries off, and more. Pencil Lengtheners are very handy colored pencil accessories. They help extend the life of your colored pencils and save you money in the long run. I can't draw without these tools! So gather up your colored pencil accessories and learn more about this medium!